Above image courtesy of Westin Bellevue (also the swimming pool and spa pic). All other images were taken by and are copyright of The Daring Gourmet. My husband and I recently took another trip to beautiful Bellevue, Washington. This time we decided to take our 2 year old daughter with us to enjoy some quality time with her while our 4 year old son enjoyed being thoroughly pampered and doted on by his grandparents. One of the reasons we chose to take our daughter with us this time is because this trip involved a lot of FOOD and unlike our son who’s in “picky eater” stage, our daughter loves to explore new foods. So this was the perfect trip for her. We strapped the kids in their car seats, dropped our son off at my parents (he excitedly ran to the door and only briefly looked back to give a quick wave goodbye before hop-skipping into the house), and drove to Bellevue. We were really looking forward to our night’s stay at the newly renovated Westin Bellevue Hotel and the following day’s activities with our 2 year old in tow: Taste of Main (Bellevue’s annual food festival), the Bellevue Farmer’s Market, and Mercer Slough’s Blueberry Farm! Bellevue’s always a fun place to visit. Ranked #4 “Best Place to Live” by CNN, the 9th “Safest City in America”, and one of the “Coolest Suburbs Worth Visiting” by Travel + Leisure, it’s also a great travel destination. The Westin Bellevue Hotel is centrally located in downtown Bellevue and close to all the shopping, restaurants and entertainment. You can take advantage of the valet parking and enjoy many of the sights and attractions of Bellevue on foot. 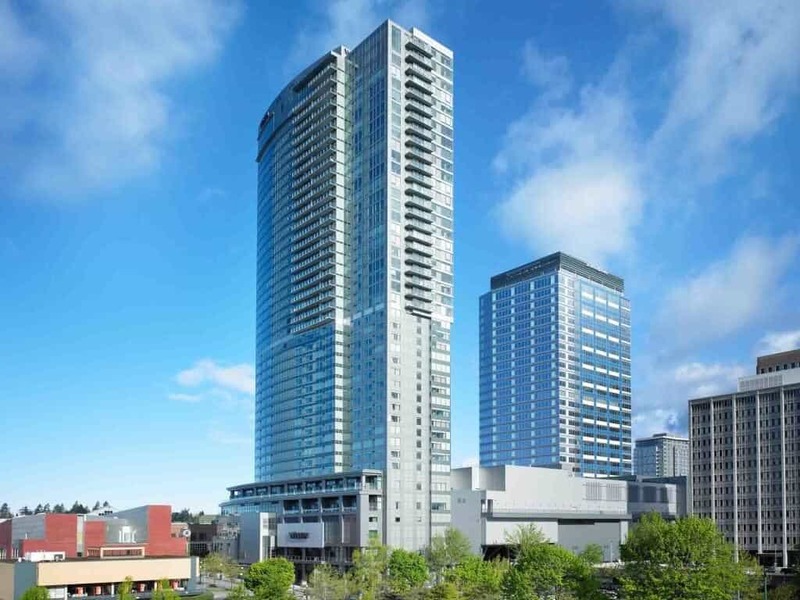 It’s also a great place for family-friendly travel, being just a short walk to several downtown parks, kid-friendly restaurants, and such entertainment as the Bellevue Arts Fair and Bellevue’s Magic Season. The AAA Four-Diamond award-winning Westin Bellevue Hotel was everything it promised to be. We liked the Westin from the moment we entered and checked in at the front desk. The staff was very friendly, professional, and were thoughtful to make sure all of our needs and comforts were met. They even asked if we’d like to have some milk and cookies sent up for our daughter before bed. 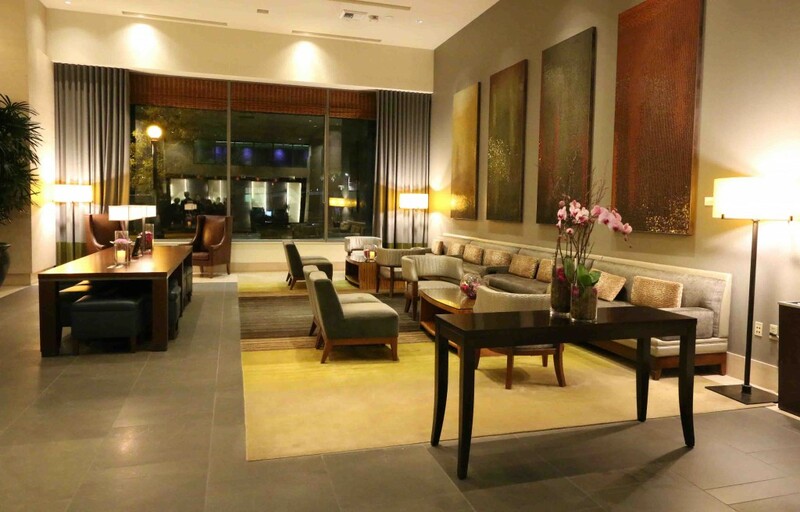 The lobby is simultaneously chic and cozy with lots of soft lighting and terrific ambiance in the evening. We enjoyed the live music streaming through the lobby from the Cypress Lounge & Wine Bar just across the hall. I love its super classy combination of retro-modern decor and furniture. The Westin Bellevue has some fantastic amenities. 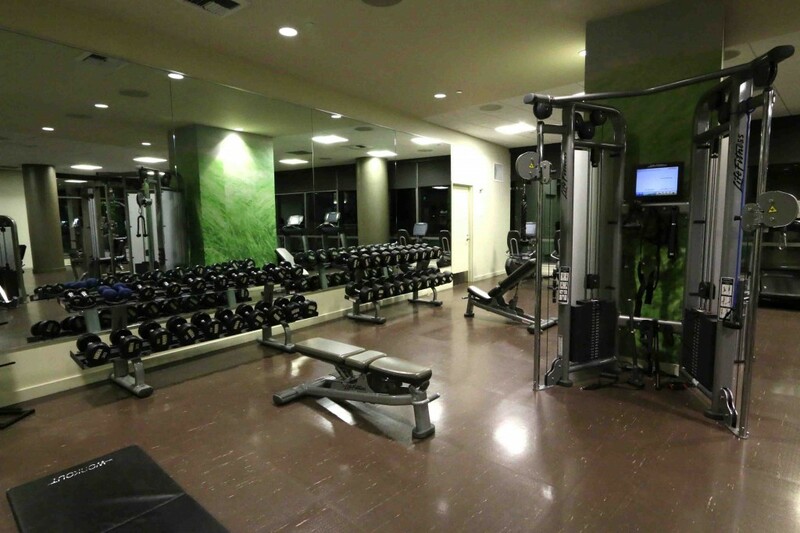 Whether you like to work out at night or in the morning, or any time in between, the Westin Bellevue’s gym is by far the most equipped hotel gym we’ve seen. It has everything. And plenty of it. And even if you’re not the workout type, just looking at this gym will leave you feeling inspired to turn a new leaf. And in case you didn’t bring your workout clothes, Westin has you covered. On the bathroom mirror in your room you’ll see the sticker below on the far right letting you know that you can borrow everything you need – New Balance clothes and shoes – for the duration of your stay for only $5. No excuses now. If you like to swim or just enjoy lounging in or by the pool, next door to the gym is the swimming pool and jacuzzi. And if you enjoy being pampered (who doesn’t from time to time?) Truce Spa will take good care of you. It was time to head back to our room for the night. We stayed in one of their 635 sq ft Corner Studio Suites and wow, was it fabulous! Super comfortable king bed, nice contemporary sitting area, and beautiful views of the city, Lake Washington, Mt. Rainier and downtown Seattle across the water. 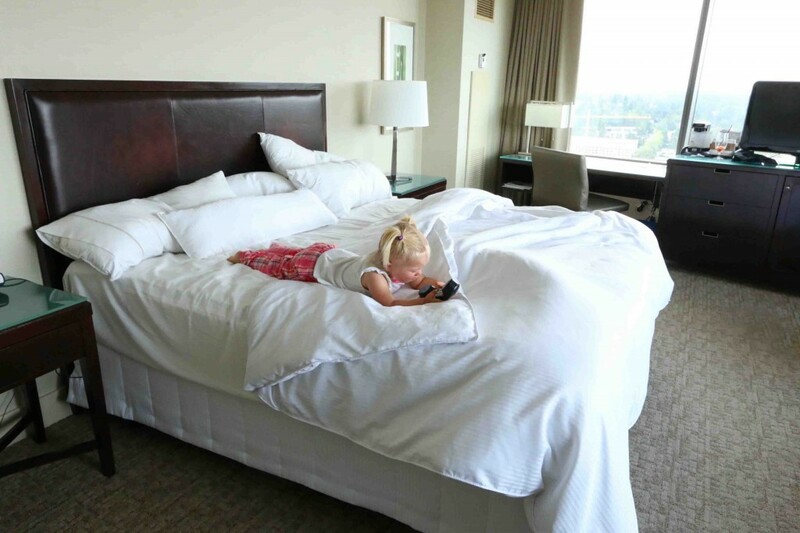 The Westin is known for its signature Heavenly Beds and they even have Heavenly Cribs you can borrow, ensuring your whole family will enjoy a very comfortable night’s sleep. We did. Within minutes of arriving to our room we heard a knock on the door. In came a gorgeous wood platter with an assortment of goodies and some scrumptious chocolate cupcakes with fresh strawberries. We thoroughly enjoyed Westin’s top notch service. Our daughter shared the selection with us and was ready to go to bed. We still hadn’t had dinner and ordered room service since she was sleeping. Cypress Lounge & Wine Bar, the hotel’s restaurant located on the lobby level, serves regional wines and savory bites. The atmosphere is contemporary and cozy with a fireplace for ambiance. You’ll enjoy live music while savoring classic American fare with an upscale twist. We called down to Cypress, they took our order, and within 20 minutes or so we enjoyed our hot food and cold drinks. We both enjoyed a refreshing virgin Citrus Pomegranate Sunrise with fresh lemon & lime juice, orange juice, agave syrup and POM wonderful. Todd ordered the Snake River Farms 1/2 pound Kobe Burger with Tillamook cheddar cheese, caramelized onions, cured tomato and lettuce. I tried one of each of their Artisan Sliders: The Kobe Style Burger with bleu cheese, grilled zucchini, lettuce, and tomato and the Slow Roasted Pork Belly with Asian slaw, crispy onions, and sriracha bbq. Everything was very flavorful and delicious and we enjoyed our meal overlooking the city lights. Our suite was amazing. With panoramic views on two walls overlooking a beautiful evergreen landscape, Lake Washington, Mt. Rainier and Seattle in the distance, a cozy lounging area and a super comfortable bed, we both agree that it was the nicest hotel room we’ve stayed in yet. It was superb. Our shower was fabulous. Beautifully bright and cheerful with windows on two walls letting in the morning light, softened by the sheer shower curtains. The wall behind the main mirror is actually one large window and the effect of the light coming in from behind the mirror and radiating out from the sides is really neat. 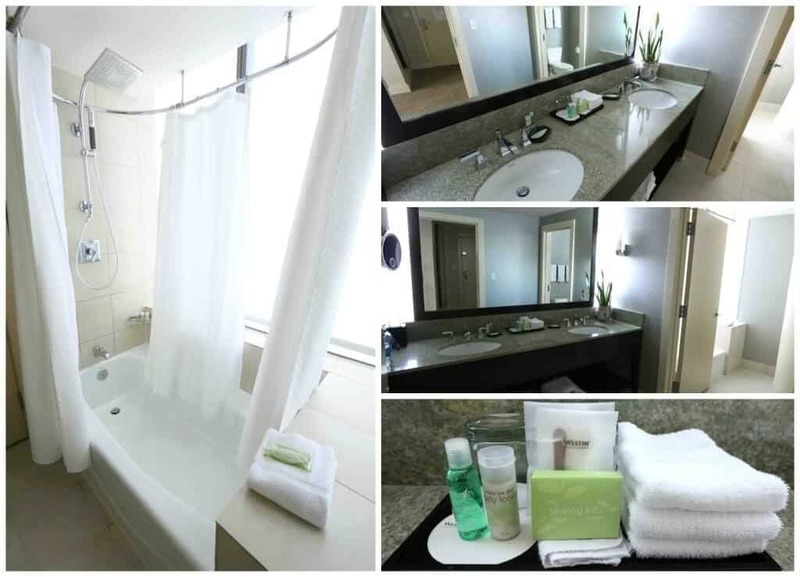 A shower in that bathroom with it’s bright, contemporary atmosphere left us feeling rejuvenated. The next morning the room also lit up bright and beautifully and our daughter made herself right at home lounging on the bed and playing with the room’s phone. Our apologies to the Westin Bellevue if she made too many calls to the front desk or restaurant! The Westin provided our daughter with a kids’ activity packet which we gave to her that morning to keep her entertained while we got ready. It worked! Our daughter stayed nicely entertained and perfectly content perched at the desk, happily coloring away. The panoramic views were stunning. Our daughter wasn’t remotely scared of heights and had fun identifying all the things she saw below and out in the distance. After our nice shower and our daughter’s coloring session we headed down to Cypress Lounge & Wine Bar for their Superfoods breakfast buffet. It was still a little cool outside early in the morning so we ate indoors, but just outside Cypress is a lovely outdoor patio that is available seasonally. We enjoyed a hot buffet with such items as French toast, roasted fingerling potatoes, scrambled eggs, bacon and sausage. There are a variety of fruits and fresh berries to choose from as well as yogurt, bagels, breads, croissants, Danish pastries, smoked salmon, a variety of cheese, salami, cured ham – a fantastic selection to leave you charged up for a while. Was particularly fabulous was the cooked-to-order omelet station. You’re given a card at the table with dozens of different ingredient options you can choose from for your custom-made omelet. You can watch the omelet chef at work and my is he fast! The omelet was A++. 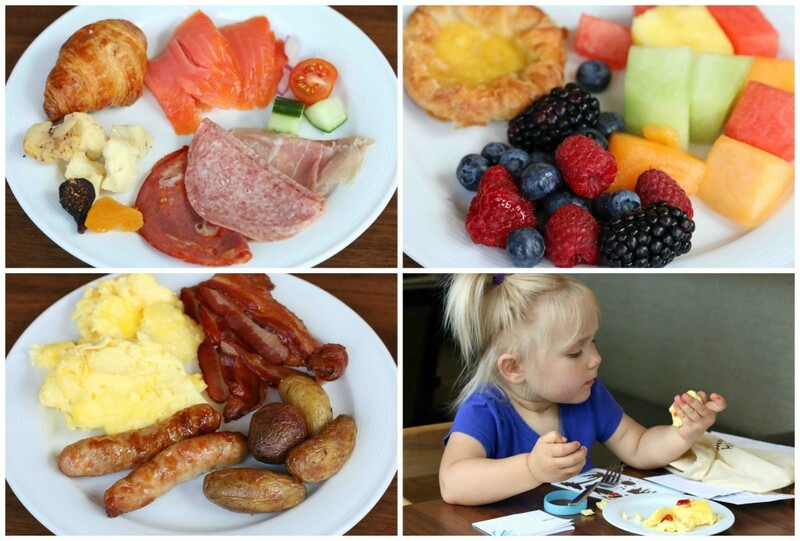 The variety was fantastic and we took our time enjoying a leisurely breakfast. Once again our daughter kept entertained by continuing her work on Westin’s complimentary kids coloring/activity packet and nibbled some food here and there while she was at it. After breakfast we still had some time to enjoy before heading over to Taste of Main, so we walked a few short steps to the cheerful Bellevue Farmer’s Market. 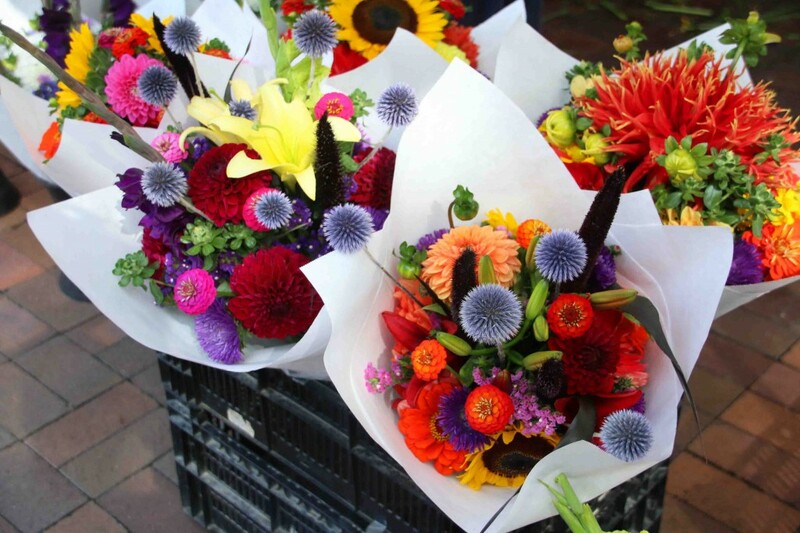 Local produce, eggs, honey, artisan breads, cheese, pastries, pasta, wine, and beautiful flowers are a few of the things you’ll find here. We got there just as it started and were happy to have beat the crowds. We were able to leisurely walk up and down main street sampling all of the food. 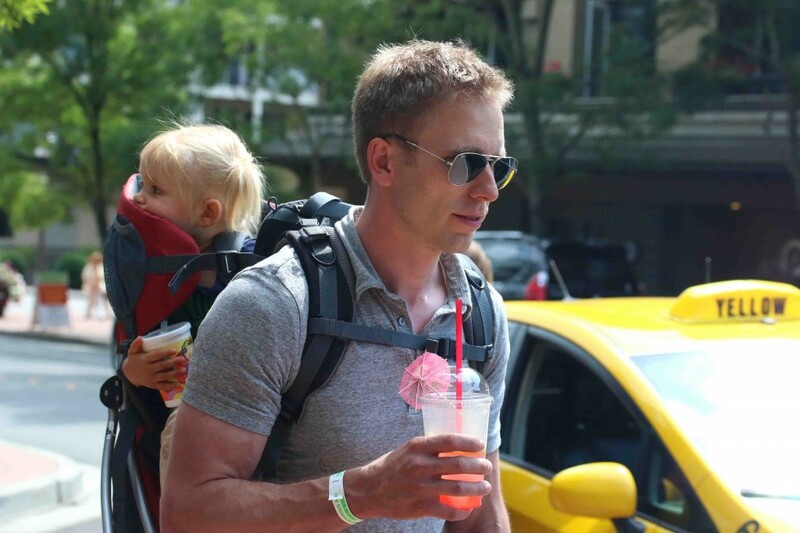 We took our Deuter Kid Comfort child backpack with us again and it was absolutely perfect for the event. Our daughter was able to enjoy the sights, sounds and smells from a high vantage point while we slipped her samples of the food. She was perfectly content and such a good sport the whole time. Below are a few examples of some of the goodies we sampled. We enjoyed everything from upscale (such as the pea soup and salmon ravioli from Zagat’s 94 rated Bis On Main), to solid American fare (like the sliders from Local Burger), to a variety of ethnic cuisine and handcrafted chocolates. Well fed we headed back home but made one more stop in Bellevue on our way out. 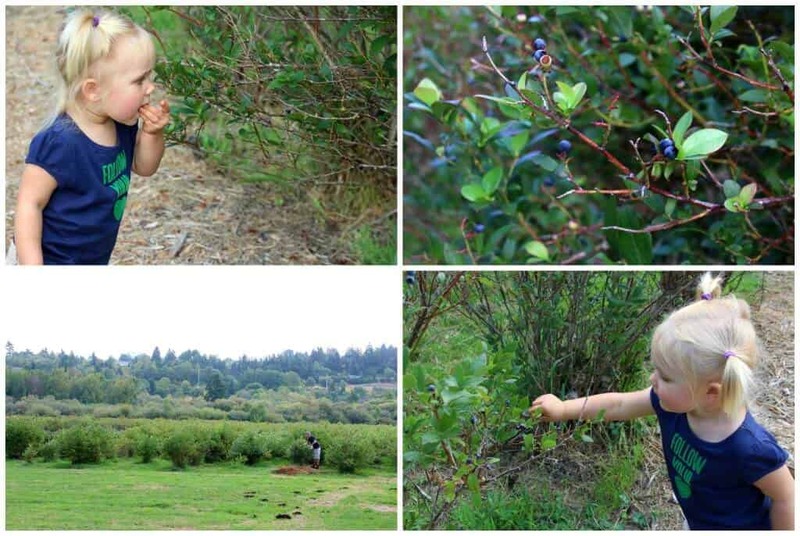 Mercer Slough’s Blueberry Farm. 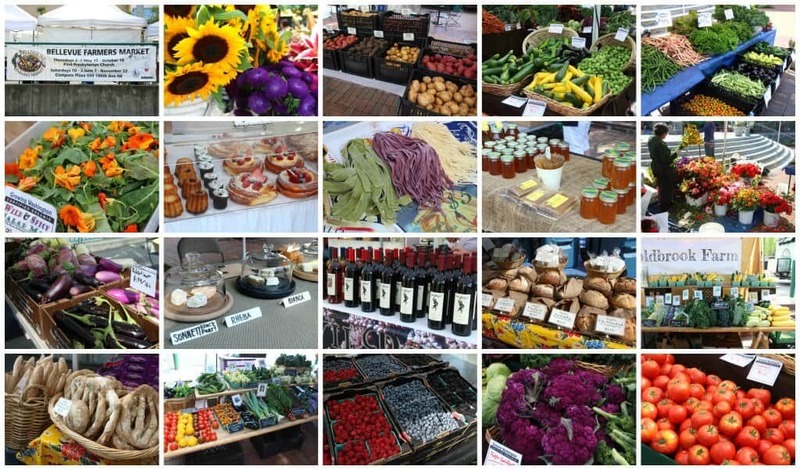 You can buy a variety of local produce here and the highlight is the u-pick blueberries. Having sat so long in the child backpack, a stop at the Blueberry Farm was the perfect way for our daughter to stretch and get a few wiggles out. And of course to enjoy a few blueberries at the same time. How many you pick is entirely up to you and we saw several full buckets head back to the farm store. And with a price of just $1.50 per pound, you can enjoy blueberries to your heart’s content. Picking blueberries together was a fun family activity. We had blast in Bellevue enjoying some quality time with our daughter surrounded by all kinds of food fun. Bellevue is always a fun place to visit and we particularly enjoyed it this time staying overnight at the fabulous Westin Bellevue Hotel. For more information on the Westin Bellevue Hotel, visit their website and follow them on Twitter @WestinBellevue. Be sure to also check out their Special Offers. Click Here for more information on Cypress Lounge & Wine Bar. 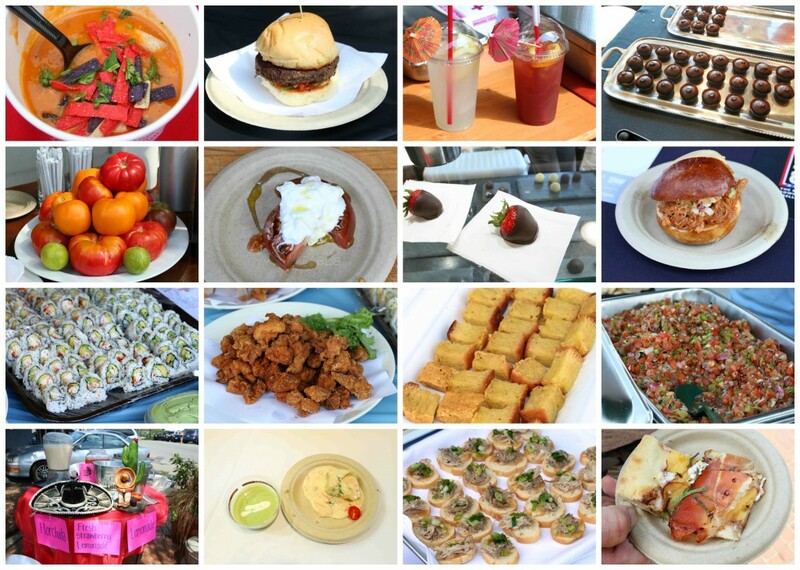 Interested in attending Taste of Main next year? Visit their website closer to the time for more information. For more information on things to do in Bellevue, Washington Click Here. Disclosure: Westin Bellevue Hotel provided us with a complimentary room and food for our stay and we were provided tickets for Taste of Main. No further compensation was received and, as always, all opinions are 100% my own. How fun! That’s so neat that you take the time to expose your children to such a variety of things. So great for their development, invaluable bonding time, and such great memories. Love all of your photos. I’m really hungry now! That breakfast at Cypress sounds wonderful and Taste of Main sounds like a lot of fun. Thanks for sharing. P.S. Your daughter is SO adorable! Thanks so much, Amy! This is the first time we took only one of our kids with us. It was actually really nice to have that one-on-one time with her for our little getaway and we’ll probably do the same with our son the next time. Plus, it gives one of them some really great quality time with my parents too, getting all that undivided attention. The breakfast was fabulous – love the omelet station especially – and it was a fun trip overall. You’re welcome, Lisa, and thank you! Agreed, everything about the Westin was fabulous and we really enjoyed all the food fun in Bellevue. My sister used to live in Bellevue and still talks about it. Lovely city, beautiful hotel (your room looks fantastic), and that food festival sure sounds like a lot of fun. We had a blast, T.L. It really is a lovely city and we LOVED the Westin, the room was absolutely terrific! I also have a sister in Bellevue and love the area every time I visit! Beautiful family and photos! Thanks, Cori! Bellevue is a great travel destination. Lots of things to do and just minutes away from downtown Seattle. It looks like you guys had a lot of fun! Beautiful photos of the hotel and all the food events. Thanks, Cathy, it was a lot of fun! We always use the Bellevue Westin as a stopover point when we fly into SeaTac and are heading to the San Juan Islands. Bellevue has a great Whole Foods where we stock up before we hit the islands. 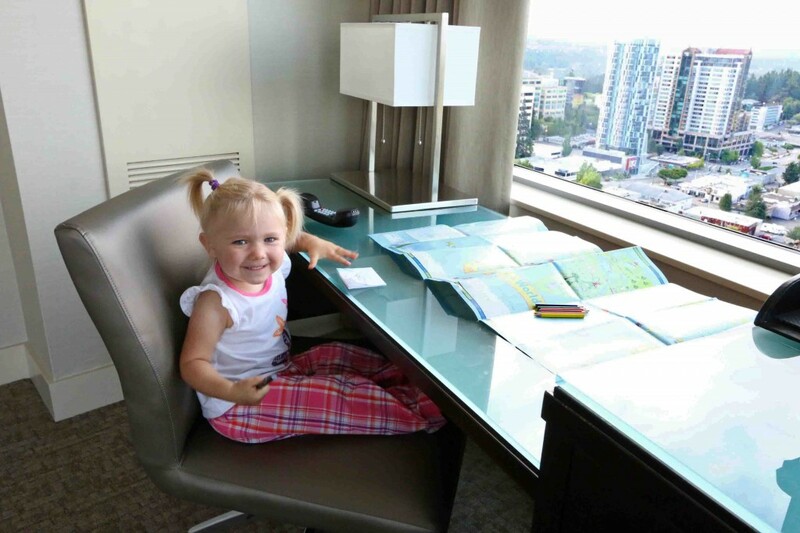 Depending on when we fly in, we stay at the Westin – love that spot! Great choice, Andi, thanks for reading! I hope so, too, LyndaS – you’ll love it! That is a seriously amazing view – the whole hotel looks like a great place to stay, actually. I’ve stayed at a couple of other Westin’s, so I’ll definitely remember if I ever get over that way! If you ever visit Bellevue or Seattle, which just a few short minutes from Bellevue, the Westin is a terrific option, Heather! Wow, all of these pictures make me want to plan a visit now. I have always loved Westin hotels and this one looks so relaxing. Great location, great food and beautiful accommodations! Really truly, Ashley! We’ve always been impressed with Westin hotels as well and the Westin Bellevue is top notch. We loved it! First of all, your daughter is ADORABLE! The Westin Bellevue looks wonderful, and the food! It looks so good and I’d love to have been at the Taste of Main! I haven’t been blueberry picking since I was a teenager! What a fun trip, glad your family enjoyed it. Thanks, Christina! :) The Westin really was awesome and Bellevue’s always such a great place to visit! Okay, not to copy what Christina above said but I can’t get over how cute your little girl is. So precious! The Westin Bellevue looks gorgeous too! I love how many photos you have of the food. I feel like I just relived the trip with you. I’ve never been to Bellevue but now I see there’s a great reason to check it out. Thanks for the virtual tour. Thank you! :) She really is, and it was so much fun enjoying this getaway with her! This looks like so much fun! I love that you had one on one time with your daughter!! What a great memory! I love Westin’s Stay Fit program! I’ve used it before when traveling for business and didn’t want to pack workout clothes. And with all that awesome food you’re showing us from Bellevue … I’d definitely want to get a run in! I know, Rachelle, Westin’s Stay Fit program is so awesome, it’s really terrific that they loan you clothing and shoes at such a cheap rate – it saves a lot of packing or (like me) when you simply forget to bring the stuff with you! I’ve never been to Bellevue! I love the little details that Westin provides… the workout clothes offer??? That’s amazing. So many people cannot bring fitness clothes when they travel because they just take up too much room. Brilliant. The view from your hotel room…looks amazing! And the food, looks great! I really like The Westin brand and, wow, what a view you had from your room!